Defence minister Manohar Parrikar will inaugurate a renovated school building here on Sunday after the Gorkha Janmukti Morcha was unable to get his cabinet colleague Rajnath Singh's date. Parrikar is visiting the hills at a time questions are raised on whether the BJP takes the Morcha as a serious ally. Parrikar will reach Darjeeling tomorrow and inaugurate the renovated Ramakrishna Siksha Parishad on Sunday. The GTA has renovated it as a "model school" at a cost of Rs 15. 98 crore. 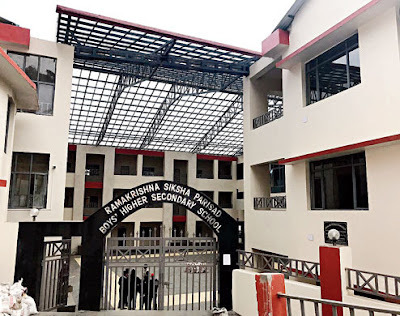 The Morcha had always claimed that it would invite Rajnath Singh to inaugurate the renovated school and two parking complexes in Darjeeling. With Singh being unable to work out dates for Darjeeling, Parrikar has been asked to do the honours. The Morcha, which is at loggerheads with Mamata Banerjee, had claimed that since most of the major projects in the hills were being executed from the Rs 600 crore special package from the Centre, the GTA would want Union ministers to inaugurate them. The two parking complexes are yet to be completed. Parikkar's visit is expected to help the Morcha politically as the move has given the party a catalyst to boost the cadre's model. Roshan Giri, the general secretary of the Morcha and an executive GTA Sabha member, said: "A visit by the Union minister is very significant for us. It is significant both for the GTA and the party." The GTA has got an opportunity to showcase its development initiative and for the Morcha, the minister's visit will help reignite the debate on Gorkhaland demand. Arun Chhetri, the spokesman for the Gorkha Janmukti Yuva Morcha, said: "The Yuva Morcha today held a meeting in Darjeeling where we have decided to submit a memorandum to the defence minister on the need to create Gorkhaland. We have also decided to put some pressure on our MP, S.S. Ahluwalia, to raise the statehood demand in Parliament and work for placing a statehood bill." Ahluwalia will be accompanying the defence minister. Defence minister Manohar Parrikar will reach Darjeeling tomorrow and inaugurate the renovated Ramakrishna Siksha Parishad on Sunday. The GTA has renovated it as a "model school" at a cost of Rs 15. 98 crore.